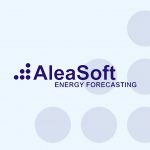 Information prepared by Aleasoft, a leading company in the development of price and consumption forecasting models in energy markets. January 19th, 2015 – In 2014, the price in the wholesale electricity market MIBEL in Spain changed accordingly to the seasonality of the hydroelectric and wind power production. The lowest monthly averaged price occurred in February with 17.12 €/MWh, while the highest monthly price was 58.89 €/MWh and was reached in September. The annual average price in 2014 was 42.13 €/MWh, 2.13 €/MWh lower than in 2013. 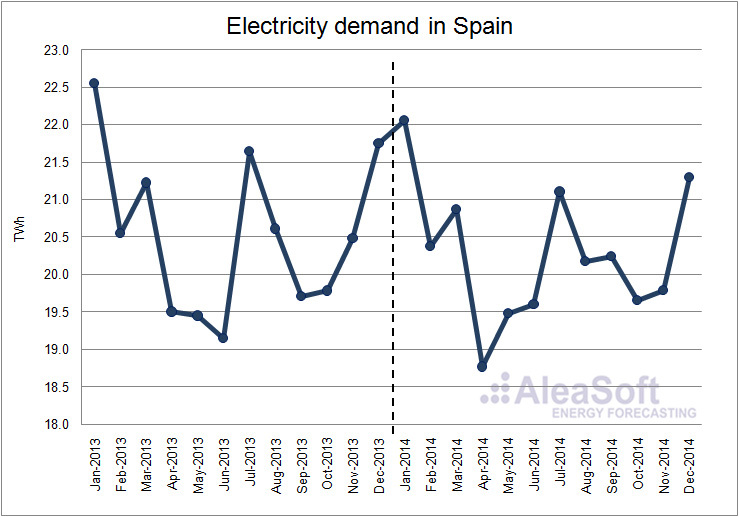 The electricity demand in Spain during 2014 was 1.2% lower than in 2013, although following data published by the system operator (REE, standing for Red Eléctrica de España), once corrected for working days and temperature effects, the fall of the demand is 0.2%. For instance, the year-on-year diminution registered in April (3.8%) was mainly caused for such effects, while the 2.7% year-on-year increment occurred in September was caused also by the increase of the economic activity (based on REE data). Electricity demand evolution in Spain. The wind power production was 6.7% lower in the year 2014 compared to the previous year, while the installed power did not increase (based on REE data). The electricity production with this technology registered, in the first semester, a decrease in the production of 2.6%, but he most important fall was in the second semester (11.7%). 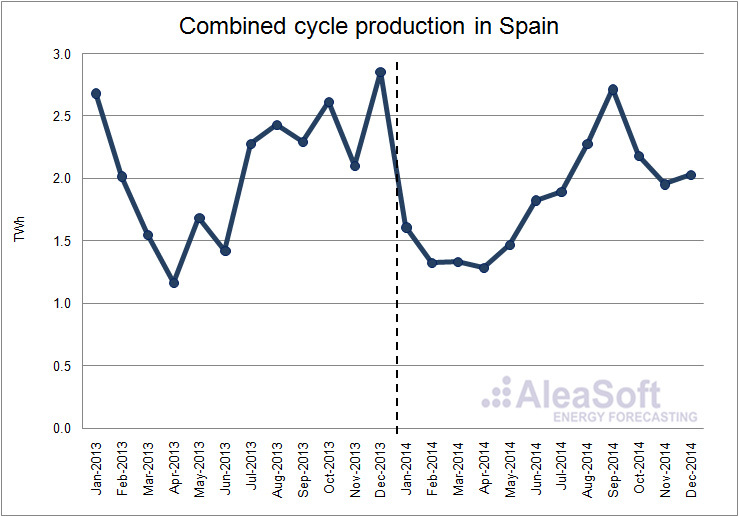 In particular, in September the production diminished by 33.7% compared to September 2013. 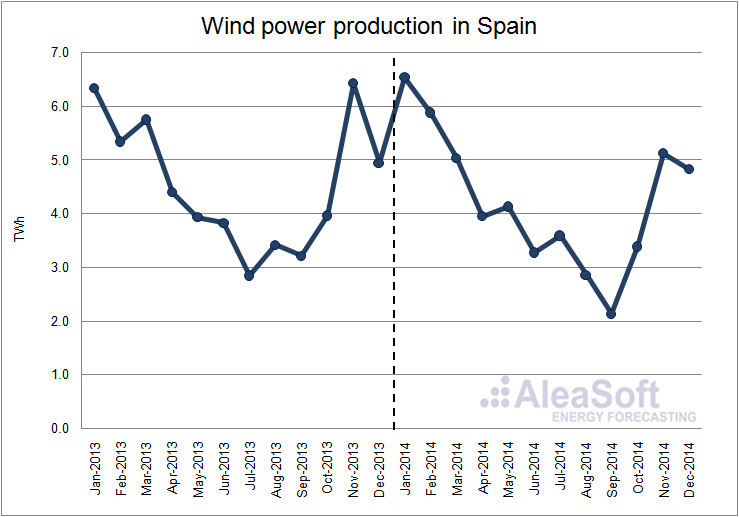 Wind power production evolution in Spain. The annual increment of the hydroelectric production in 2014 was only 5.6%. The increase registered at the beginning of the year, with a production peak in February (5884 GWh) was balanced with a stable decay in a year-on year basis along the year. 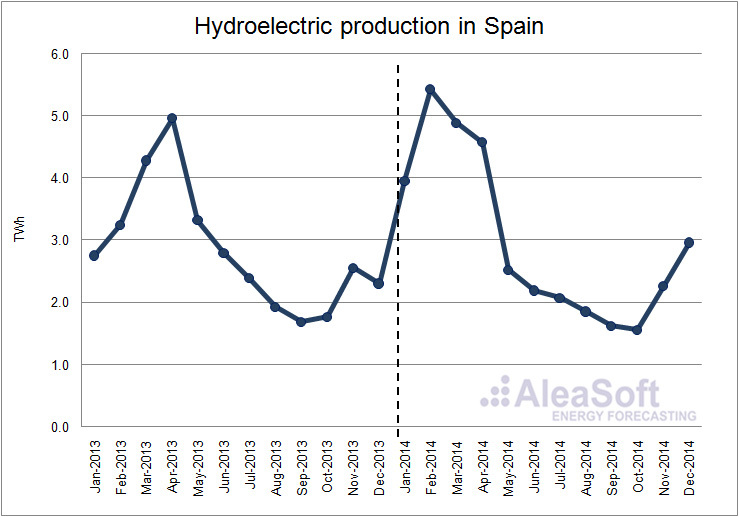 Hydroelectric production evolution in Spain. In the case of the nuclear production, a slight annual increase of 1.0% was registered. In the first and second quarters, there were small variations on a year-on-year basis (+2.1% and +0.5% respectively). Instead, the fall of 10.8% in the third quarter was followed by an increase of 14.4% in the fourth one. 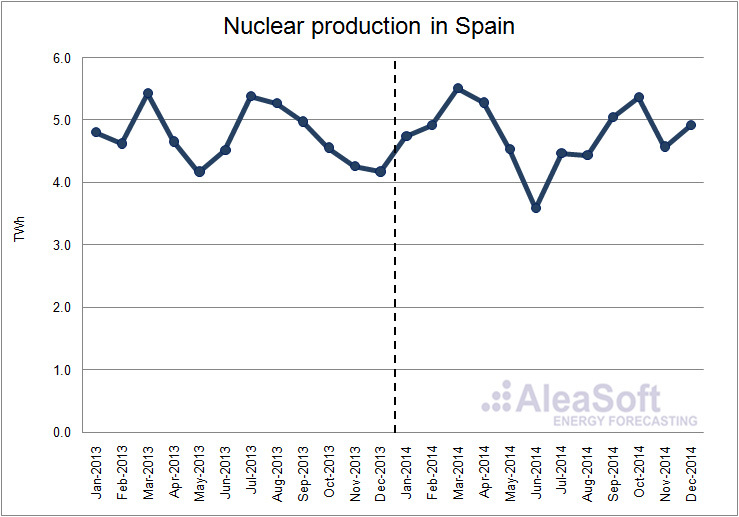 Nuclear production evolution in Spain. 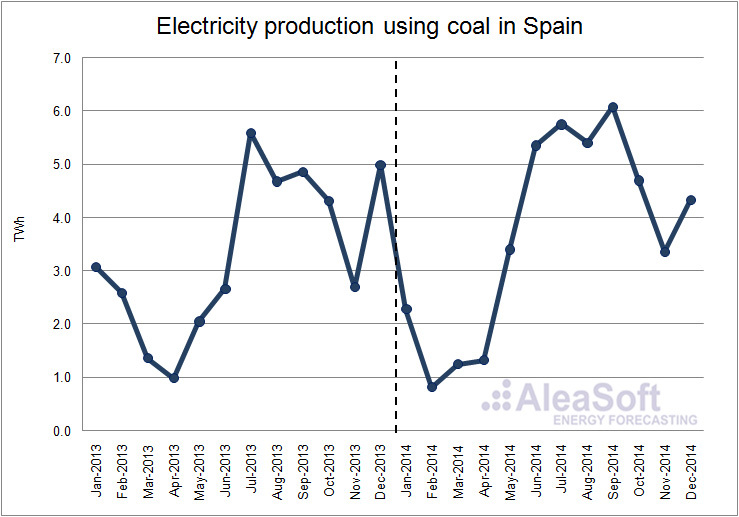 The electricity production using coal in 2014 was 10.6% higher than in 2013. The greatest year-on-year growth was registered in July (101.1%) while the largest year-on-year decay occurred in February (68.4%). The combined cycle production diminished by 12.7% in 2014 compared to 2013. A year-on-year decay in the production was registered in all months except September (increase of 18.4%). It is worth noting the year-on-year decrease in January and February (40.0% and 34.4% respectively) coinciding with a period of high hydroelectric and wind power production. 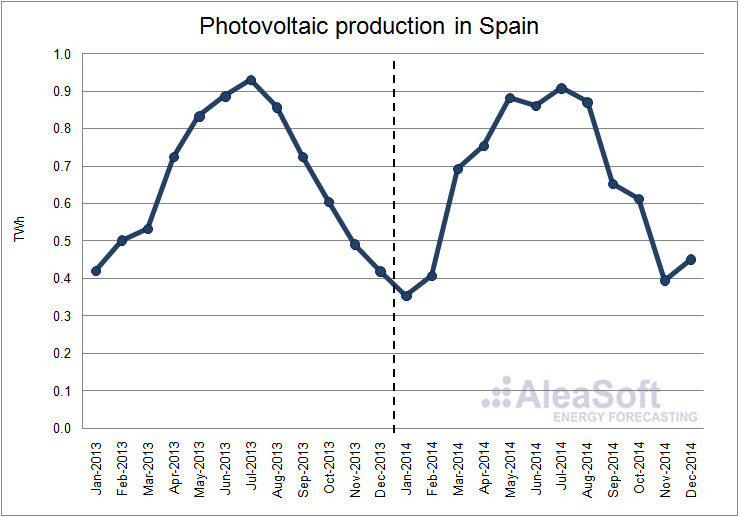 In the case of the solar photovoltaic production, the annual decrease compared to 2013 was 1.1%. In the first half of the year, a year-on-year increase of 1.3% was registered while in the second semester the production was 3.4% lower than in the same period of the previous year. 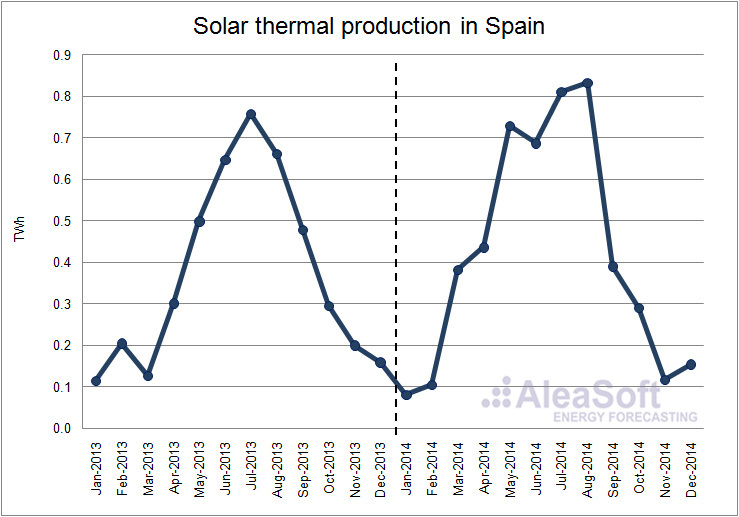 The solar thermal production was the technology with the largest growth in 2014. It increased by 12.8% compared to 2013. The first two quarters registered positive year-on-year variations (27.6% and 28.1% respectively). However, in the third quarter the increase was only 7.1% compared to the previous year and in the fourth one the production fell by 14.3% on a year-on-year basis. 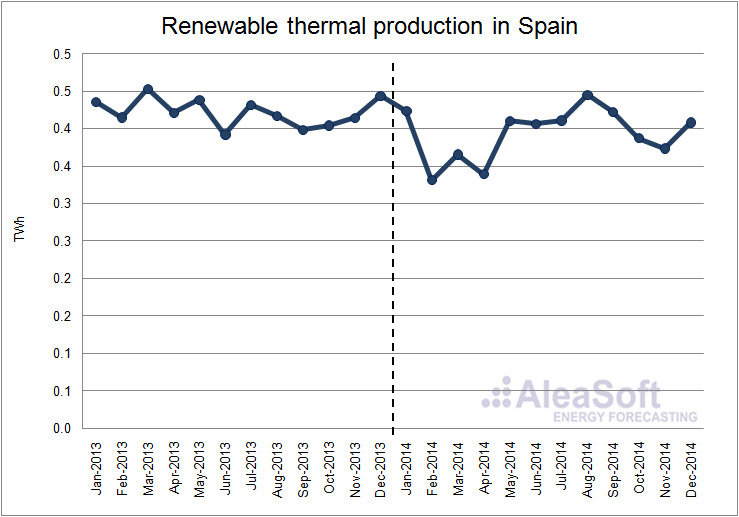 The renewable thermal production diminished by 6.8% compared to the production in 2013. On a year-on-year basis, negative variations were registered in all quarters except in the third one. In that period, the production was 2.5% higher than in the same period of the previous year. The rest of the hydroelectric production, that includes production with units smaller than 50 MW in power, was very similar to the one in 2013, with a slight variation of +0.5%. On a year-on-year basis, the most important variations occurred in May, June and December (-21.9%, -20.6% and 27.9% respectively). 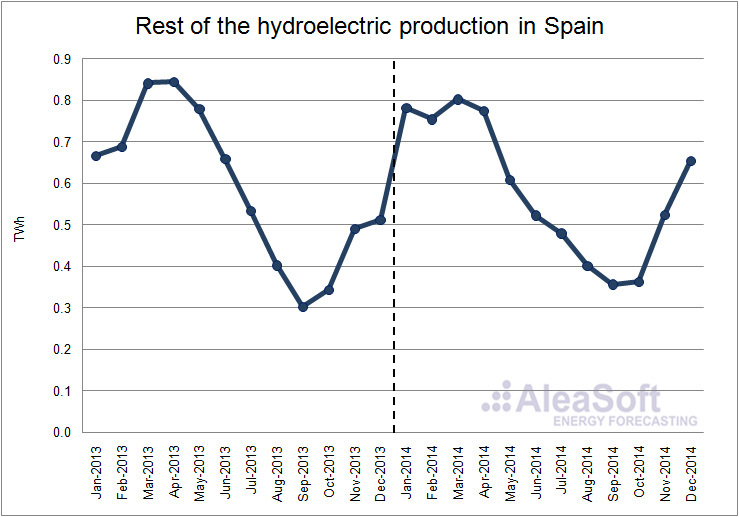 Hydroelectric production with units smaller than 50 MW in Spain. Finally the cogeneration production, together with other minor technologies, suffered a descent of 20.2% along 2014. Cogeneration is one of the worst affected technologies by the legislation changes in electricity production. In all quarters the production was lower than in the same period of the previous year, especially in the second quarter (year-on-year variation of -27.7%). 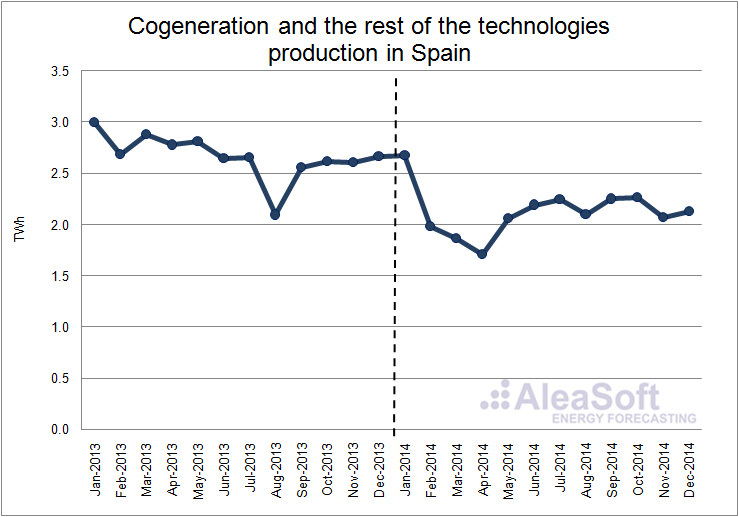 Evolution of cogeneration and the rest of the technologies production in Spain. 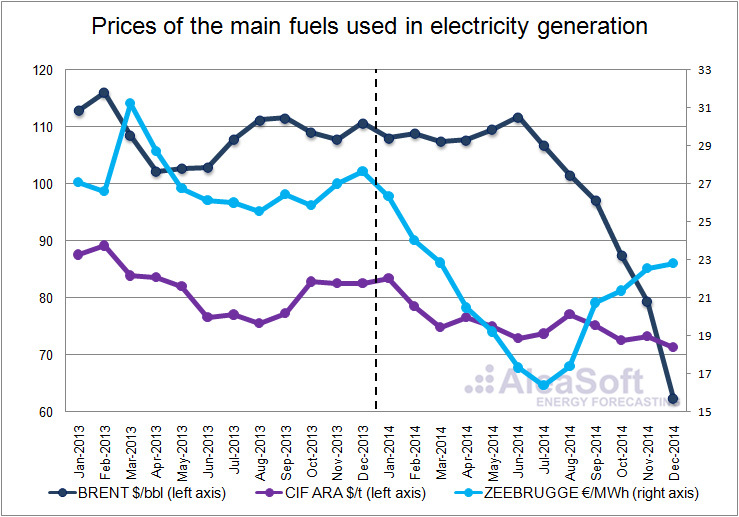 In 2014, the average price of Zeebrugge gas was 20.95 €/MWh, 6.13 €/MWh less than in 2013. The price decreased during the first half of 2014 and grew in the second half, reaching its minimum monthly average in July with 16.39 €/MWh, 9.61 €/MWh less than in July 2013. The average price of Brent oil barrel was $99.02 in 2014, $9.63 less than the average in 2013. The monthly averaged price reached its maximum in June with $111.80, then descended continuously until an average of $62.34 in December. This sudden fall of the Brent barrel price is mainly caused by the increase of the worldwide production, especially in USA, and the refusal by OPEC to cut the production of crude oil. The trend of the CIF ARA European coal price was descending during most part of the year, reaching an average value of 71.30 $/t in the last month. The average price of this fuel in 2014 was 75.35 $/t, 6.34 $/t less than the average in the previous year. Evolution of the prices of the main fuels used in electricity generation. 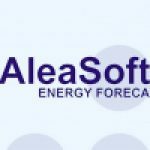 Data sources: BRENT – EIA, CIF ARA – EEX, ZEEBRUGGE- NetConnect Germany. 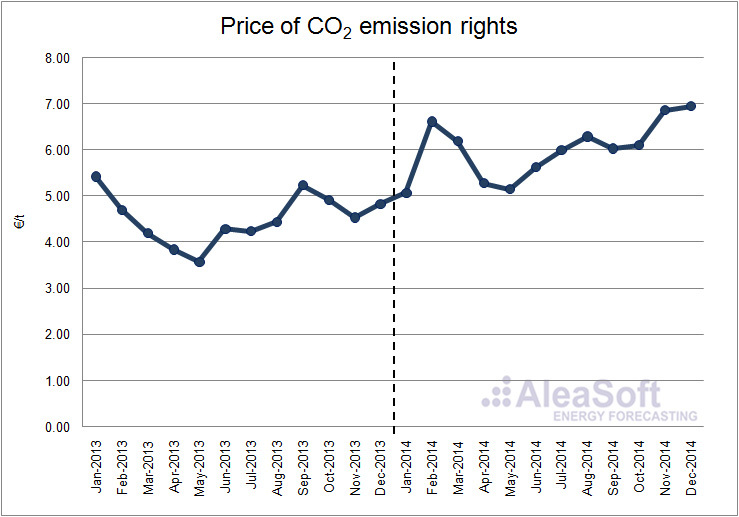 The price of CO2 emission rights grew during the year 2014, being the annual average 6.01 €/t, 1.49 €/t more than the average price in 2013. On a year-on-year basis, all months registered positive variations except January (variation of -0.35 €/t). December was the month with the highest growth (2.11 €/t). In 2014, the monthly net balance electricity exchange between Spain and Portugal established Spain as a net exporter, with 1052 GWh exported. In 2013, Spain also exported to Portugal more electricity than it imported, but in 2014 it exported 1722 GWh less than in 2013. 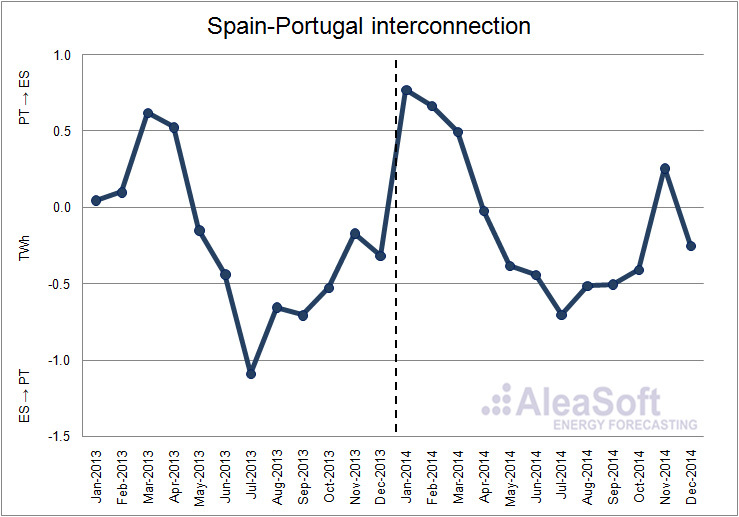 Evolution of the monthly net balance interconnection between Spain and Portugal. Positive values indicate that Spain imports electricity from Portugal while negative values show that Spain exports electricity to Portugal. 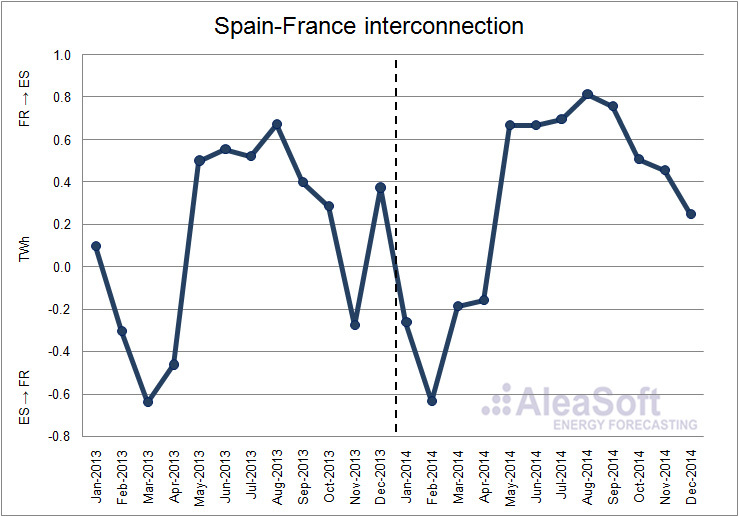 The monthly net balance electricity exchange between Spain and France in 2014 established Spain as a net importer. Spain imported from France 3564 GWh, 1708 GWh more than in the previous year. Evolution of the monthly net balance interconnection between Spain and France. Positive values indicate that Spain imports electricity from France while negative values show that Spain exports electricity to France. 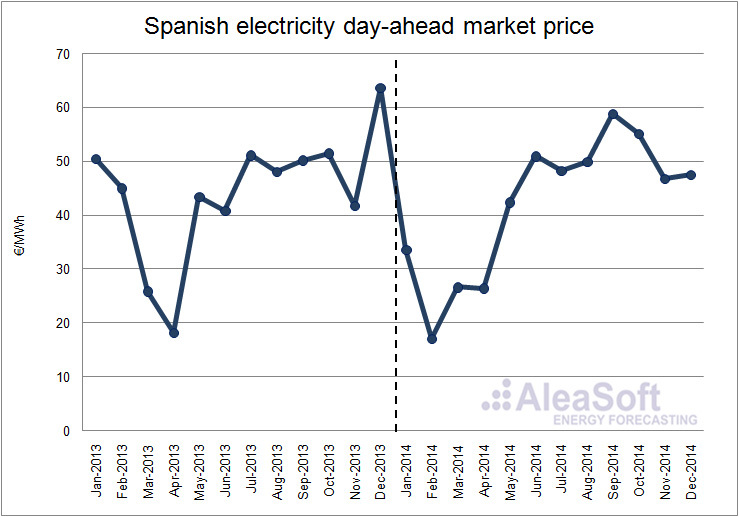 The average price in the day-ahead electricity market MIBEL in Spain had a seasonal behaviour in 2014, as expected due to its dependence on the hydroelectric and wind power production. The lowest monthly average price occurred in February with 17.12 €/MWh, 27.93 €/MWh less than the same month in 2013, coinciding with a maximum monthly value of wind power production. The highest monthly price was reached in September and was 58.89 €/MWh, 8.69 €/MWh more than in September 2013. The lowest hourly price was 0 €/MWh and occurred several times in the first quarter, while the highest one was 113.92 €/MWh achieved in March 27th between 7 and 8 p.m.
Evolution of the Spanish electricity day-ahead market price.